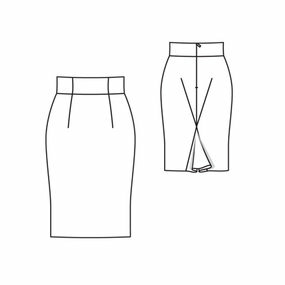 I always like high waisted pencil skirt and have made them several times. This high waisted denim skirt that I made a couple of years ago is particularly a favorite, but recently I have found that my waist is getting smaller. The wide band of the skirt has boning in it so the waistband sticks out around my waist in a strange way. 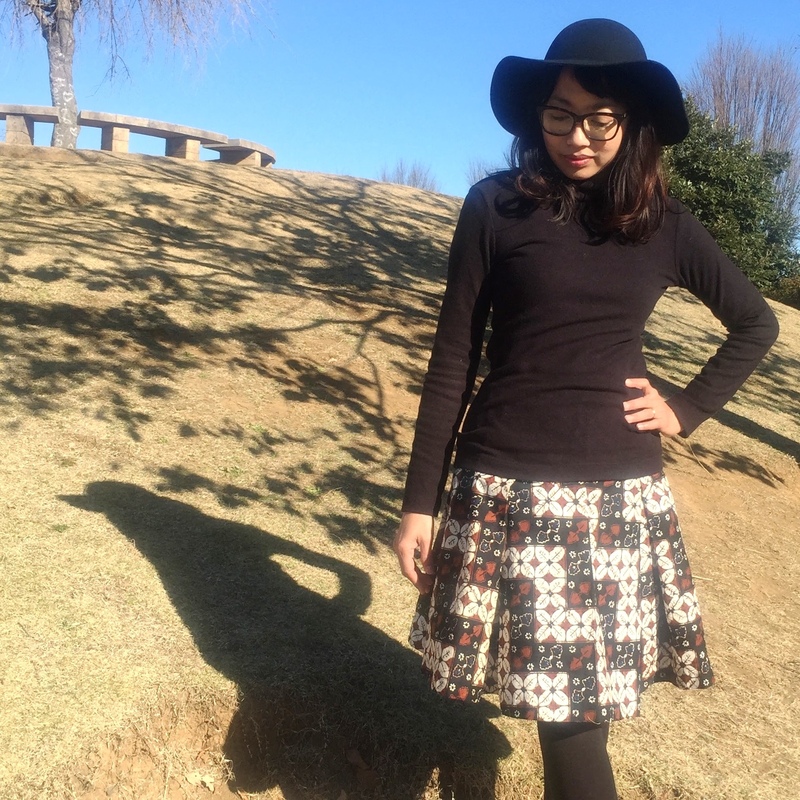 Maybe I should have altered it but I decided to make a new skirt! 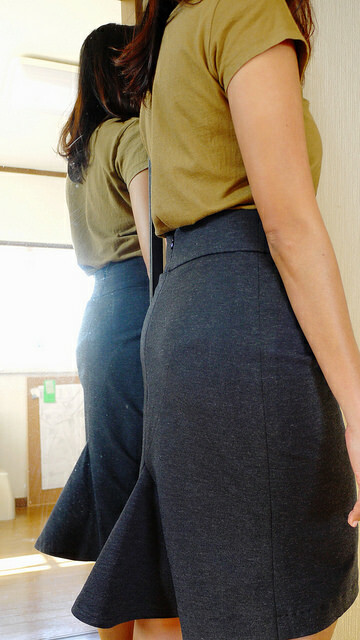 This time I use Burdastyle pattern, Stretch Pencil Skirt 02/2011 #103A. 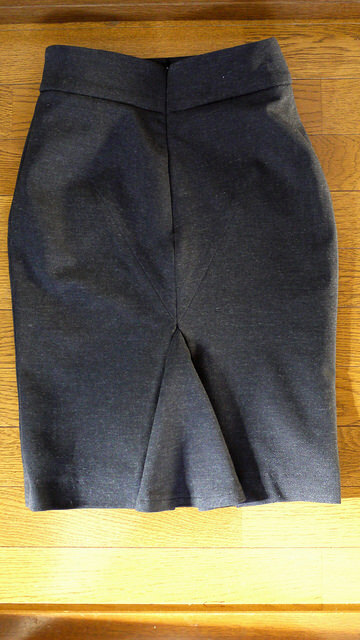 It is a pencil skirt made with stretch fabric, with wide waistband and an interesting seam and godet on the back side. I did my usual petite alteration for Burdastyle pattern, printing the pattern at 92% and cutting size 38. 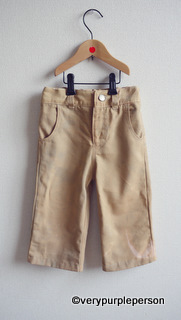 Other alterations are 1 cm swayback adjustment on the back, and shortening the skirt about 5 cm. 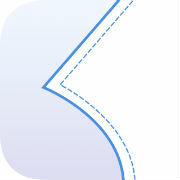 I shortened the skirt around the hip line so it wouldn’t affect the slight flare shape on the bottom of the skirt. 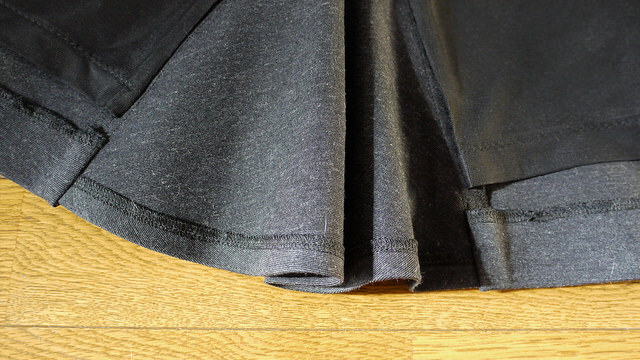 The fabric is grey black double jersey, the same kind as the one that I use for my red knit dress, and black knit lining. 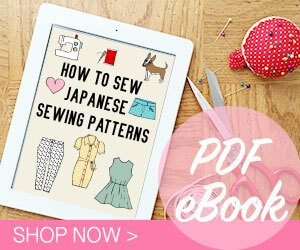 For this pattern, the lining is necessary to keep the stretch fabric from sagging. The godet part has 1.5 cm hem. I finished the godet hem first before attaching it to the skirt. The skirt has 4 cm hem that closed over the godet seam allowance on the wrong side. I don’t know if I can explain that more clearly! Please see the picture below. The lining has no godet. 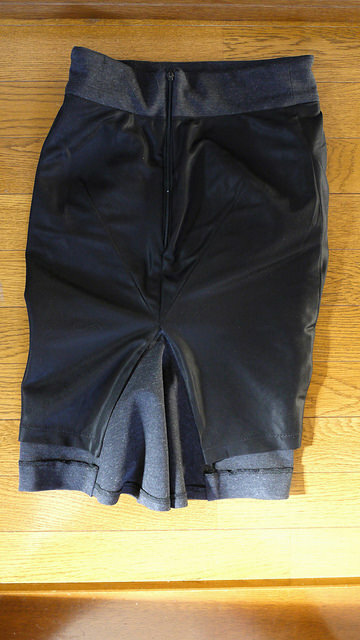 It is attached to the skirt on the waistband, on each side of the zipper, and around the godet. Everything is done on sewing machine, no handstitching! I also added some rigilene boning on the inside part of the waistband. Actually I prefer metal spiral boning, but it might be a bit of an overkill for this skirt. Since the fabric is stretchy, the skirt is very comfortable and not restricting at all. You can see how far I can lift my leg! Pattern is Burdastyle Stretch Pencil Skirt 02/2011 #103A (PDF), size 38 printed at 92%.